I’d walked past Brussels Sprouts many times on my way to Epicurious or other places on the Quay in Singapore. 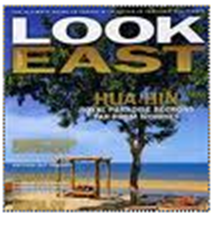 I thought it was possibly a vegetarian restaurant. It always seemed busy, a good sign in Singapore, but for some reason I never visited. Thankfully some friends of ours invited us to join them for an after-work dinner. It’s a simple concept executed well. 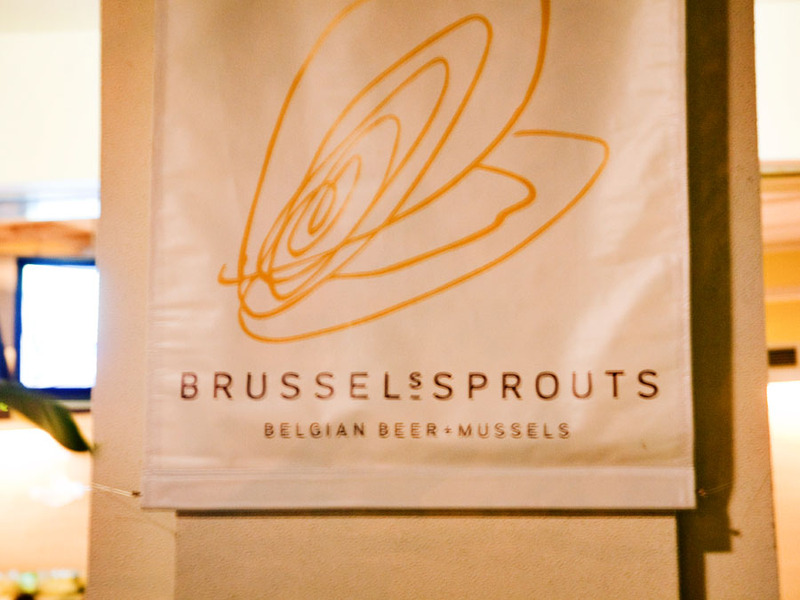 Brussels Sprouts is is a classic Belgian mussels and frites (moules frites) concept. 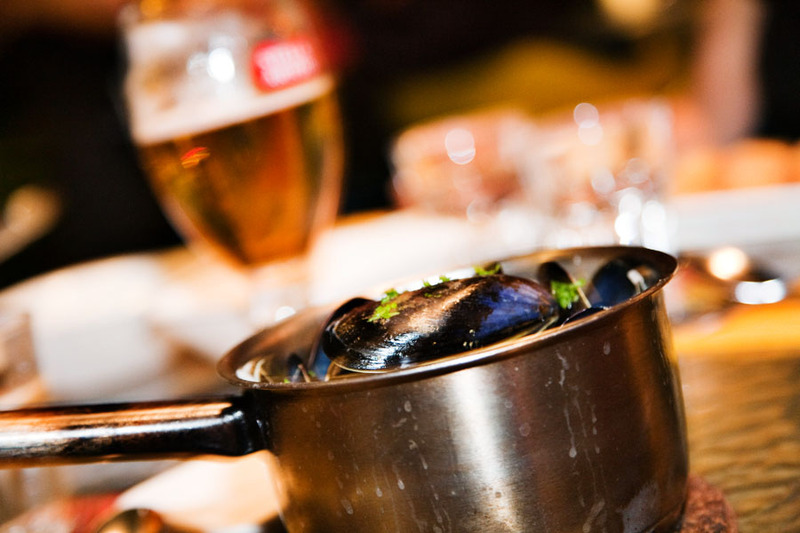 There are two sizes of mussels – 18.50 for the small and 38.50 for the large. The large is really large and since there’s a free-flow of frites we didn’t see the value in a big pot for individual consumption (it would be great though if sharing drinks with friends to all chip in and grab a large bucket of mussels). I went with the classic of black pepper, butter, celery, onion, parsley. The black pepper gave a nice finish to the mussels. Nico ordered the white wine, butter, celery, onion, parsley… equally good. Joanna however ordered up the table favorite – Thai style with coconut cream, coriander, lime, and sweet chili. It was probably the best “Thom Ka Gai” I’ve tasted in Singapore… only as a broth for some delicious mussels instead of the classic (if slightly over ordered by westerners) soup. The chilis, lime and coconut milk worked perfectly with the fruity Belgian beers and warm weather on the riverside. It might not be haute cuisine, but it’s yummy comfort food… and sometimes you just need that more. The location next to the river is great for people watching and enjoying the night air…though it can get a bit crowded after work so I’d recommend making a reservation. If you’re not in the mood for mussels there are other items on the menu (but why go to a pizza place and order pasta?) and an epic beer menu featuring some great Belgian beers. Next time I’ll have to try the Hoegaarden Grand Cru 😀 . There’s really not much more to say. 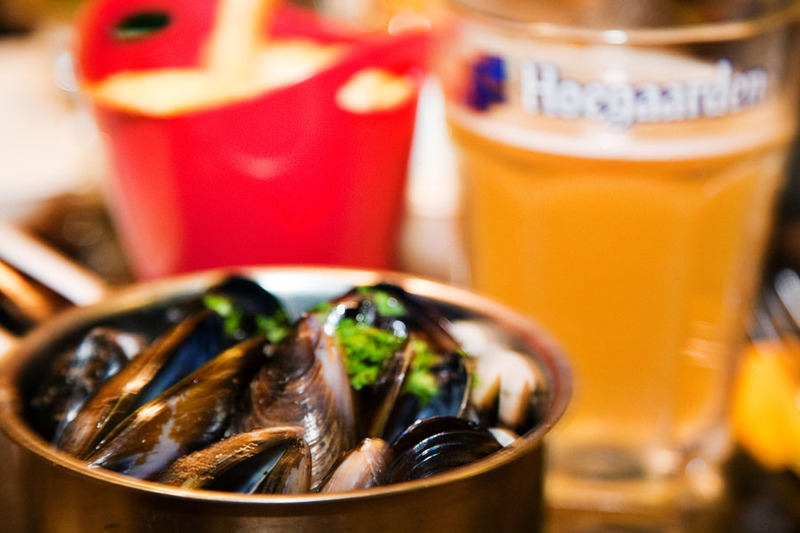 If you like beer (who doesn’t) and mussels this is a no brainer. I love restaurants that do one thing, and do it well. If you’re searching out a great after work spot for drinks with friends check out Brussels Sprouts on the Quay. Get there before 8 for happy hour or check out their mussels madness promo – 2 starter sized pots for 25 or 2 big ones for 50. If there’s one thing you gotta be careful with it’s mussels. Good to know they specialize in that. Anthony Bourdain said he never eats mussels at restaurants.